Spzan.com is the PUP that uses misleading techniques to prevent removal. Use Reimage to locate malicious components and get rid of them faster than with uninstall instructions. A full system scan blocks virus reappearance and prevents traffic to malicious domains. frequent redirects to gaming, gambling, adult-themed or other unknown websites. Spzan.com virus usually is installed in the form of a browser extension or another useful tool. Most of the time these downloads are indirect. It means users usually install them without realizing it when installing freeware or shareware. Once it infiltrates the system, Track.spzan.com virus makes several changes to the Windows and affected web browser to starts its activity. The virus typically redirects to track.spzan.com/redirect?target=BASE64 site. From here users might be transferred to any other Internet site, including online shops, shady news portals or even scam websites. Apart from redirects, adware also displays lots of ads. Some of them promote unknown programs, others provide fake shopping offers or try to convince users that their software or browser is outdated. 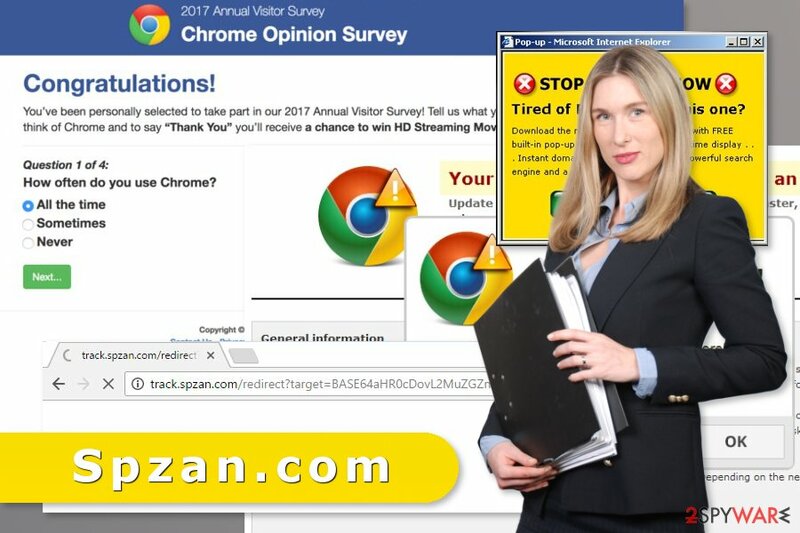 It goes without saying that clicking Spzan.com ads should not be considered if you do not want to end up on a potentially dangerous website. 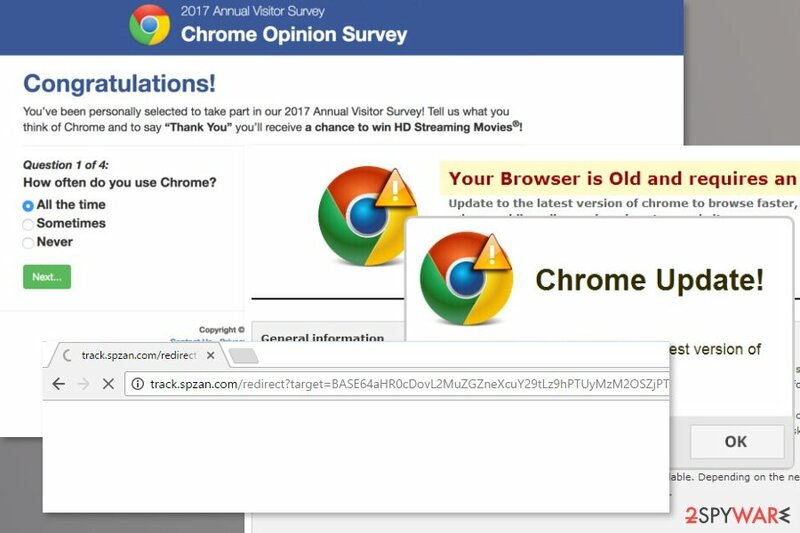 The cherry on top is adware’s ability to track information about users. Learning about your browsing habits helps to deliver targeted ads and make it hard to resist not to click them. Thus, you should remove Spzan.com virus until it hasn’t tricked you into downloading a malicious program. Spzan.com removal can be completed with anti-malware tool, such as Reimage, or manually. Manual elimination guidelines are provided at the end of this article. Spzan.com virus triggers redirects to suspicious and potentially dangerous websites. This ad-supported program is spread as an optional component in software packages. Therefore, to avoid unexpected Spzan.com hijack, you have to pay attention to freeware installation. It means you should not rely on quick installation wizard and does not hit “Next” and “Agree” buttons without reading provided information. The correct way to install programs is using advanced setup and reading each notification. You should be attentive and do not leave any pre-selected offers to download browser add-ons, PC optimization programs or similar entries. To stop redirects to Track.spzan.com sites, you have to find the adware installed to your PC and uninstall it. If you are a skilled computer user, you should not find it difficult to complete this task o your own. Otherwise, you should rely on reputable security software and go for automatic elimination option. To remove Spzan.com manually, you need to investigate the system. The instructions below will give you detailed explanation where to find adware and its components. Check our prepared guide and if it seems simple, start the process. Meanwhile, automatic Spzan.com removal requires obtaining a professional antivirus or anti-malware. Update your desired program and run a full system scan. Experts from Senza Virus reminds that once it eliminates adware, you have to reset each of the installed browsers manually. Here, look for Spzan.com or any other recently installed suspicious programs. Wait until you see Applications folder and look for Spzan.com or any other suspicious programs on it. Now right click on every of such entries and select Move to Trash. Internet Explorer reset helps to speed up adware's removal. When in the new window, check Delete personal settings and select Reset again to complete Spzan.com removal. Once these steps are finished, Spzan.com should be removed from your Microsoft Edge browser. Check Firefox extensions and uninstall unknown entries. They might be responsible for redirects to Spzan.com. Here, select Spzan.com and other questionable plugins. Click Remove to delete these entries. Now you will see Reset Firefox to its default state message with Reset Firefox button. Click this button for several times and complete Spzan.com removal. Here, select Spzan.com and other malicious plugins and select trash icon to delete these entries. Click Reset to confirm this action and complete Spzan.com removal. Here, select Extensions and look for Spzan.com or other suspicious entries. Click on the Uninstall button to get rid each of them. Now you will see a detailed dialog window filled with reset options. All of those options are usually checked, but you can specify which of them you want to reset. Click the Reset button to complete Spzan.com removal process. ^ Paul Cucu. How Malicious Websites Infect You in Unexpected Ways. The Heimdal Security blog. Cyber secirity advice. ^ Patrick Nohe. Re-Hashed: 5 Ways to Determine if a Website is Fake, Fraudulent, or a Scam. The SSL Store blog. Industry, encryption and general cyber security news. ^ Senza Virus. Senza Virus. Italian cyber security news. This entry was posted on 2017-09-26 at 07:59 and is filed under Adware, Viruses. You can quickly scan the QR code with your mobile device and have Spzan.com virus manual removal instructions right in your pocket. How did you remove Spzan.com virus?